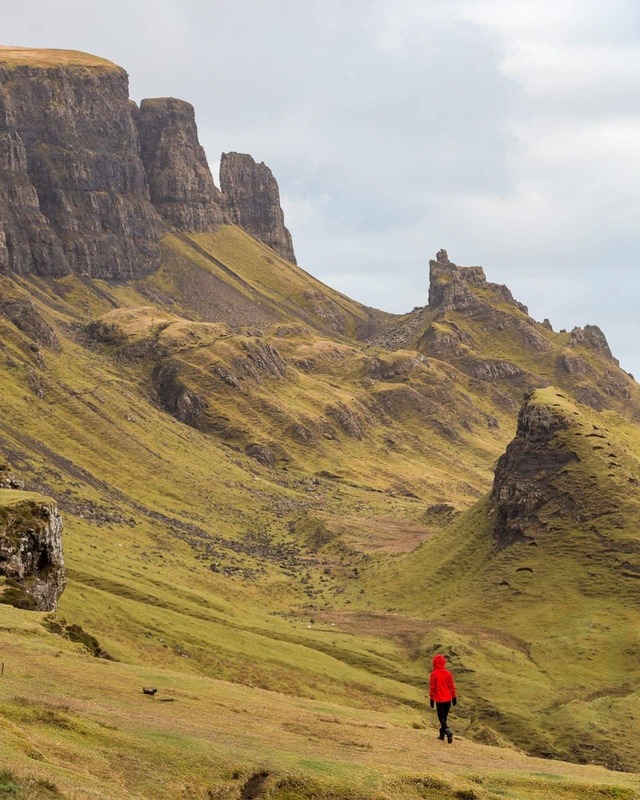 The Isle of Skye is a popular place these days, and for good reason, it’s a fantastically beautiful place with plenty to see and do. From a photography perspective, it’s a joy to visit. 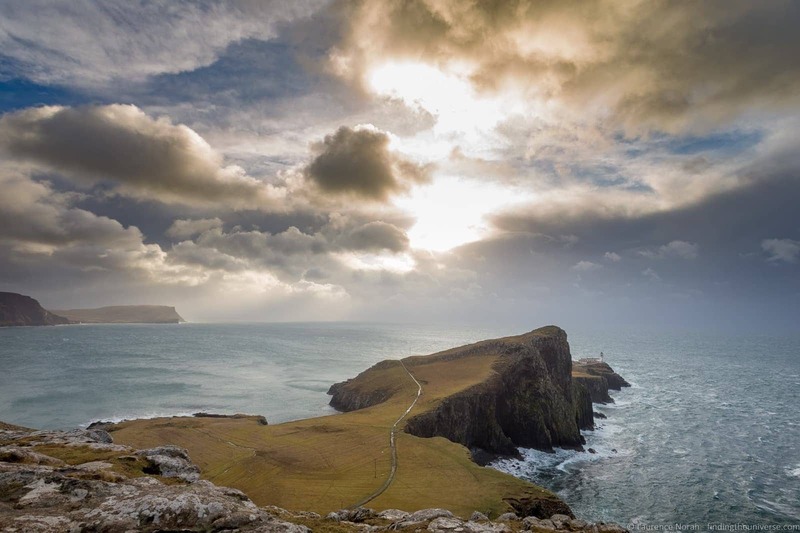 The Isle of Skye has loads of epic photography locations keep you snapping away for days. 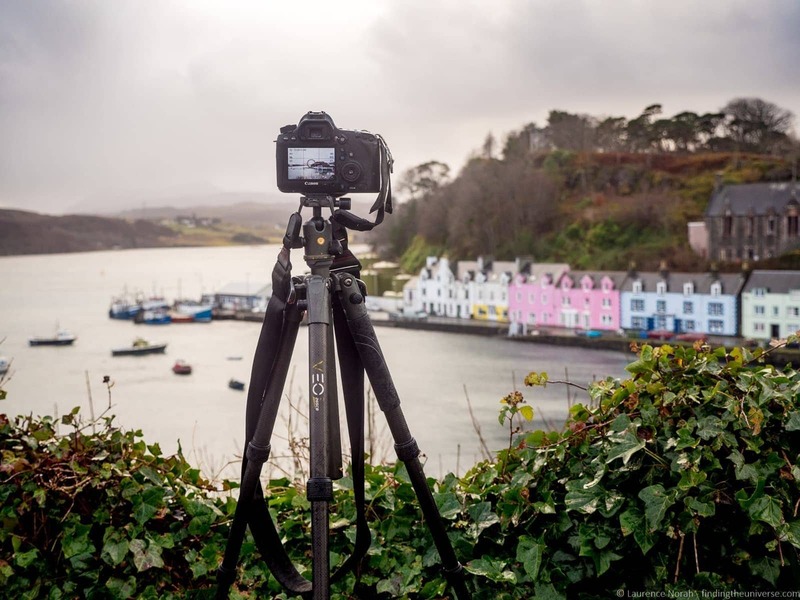 With this in mind, I wanted to put together a guide to the Isle of Skye’s photography locations, which lists some of my favourite photography spots around the island. 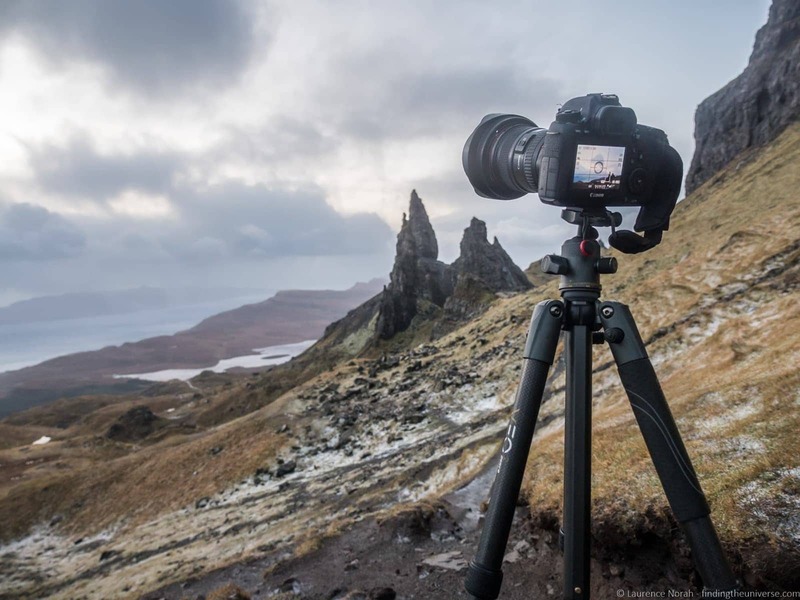 This should give you all the tips you need to help you find the best places to take pictures on Skye. Talking of gear, I used my Vanguard tripods, specifically the lightweight travel friendly VEO tripod range for most of the shots in this guide. 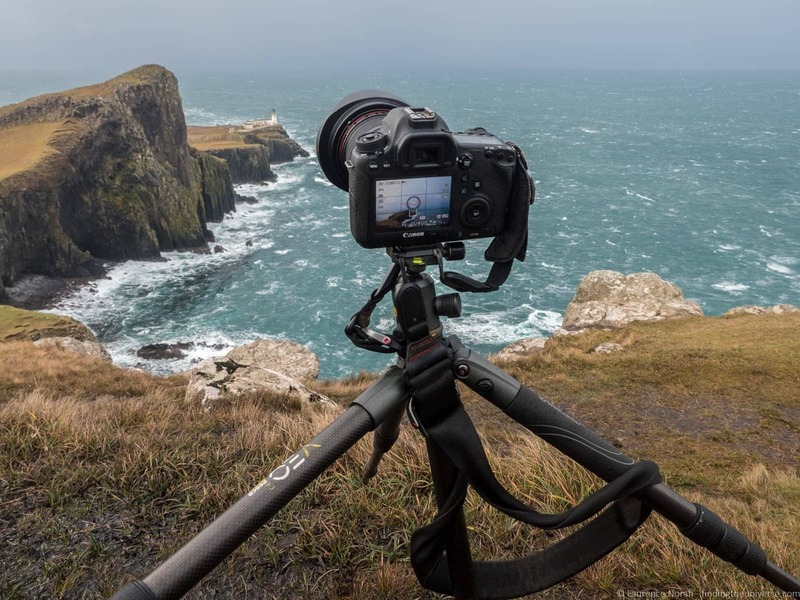 I believe a tripod is essential for photography (read why here), I love the Vanguard range, and I’m proud to be a Vanguard Ambassador. At the end of the post there’s a discount code so you can save a bit of money if you’re in the market for a new tripod (or bag!). Neist Point is the most westerly tip of the Isle of Skye, and right at the end of this outcrop of land is the Neist Point lighthouse. From the carpark, it’s a lovely walk down to the lighthouse itself, and the views along the cliffs here are spectacular in both directions. From a photography point of view though, I think that the best photos are from the cliffs near the car park, rather than from the trail to the lighthouse. If you head slightly north from the carpark along the cliffs, you’ll find a beautiful view of the lighthouse, with the path leading out to it offering a lovely leading line out to the point. There are plenty of locations to set up along here, although of course, do be careful as this is an area with steep cliffs and no fence! For my shot at the top, it was a combination of five exposure blended images in order to capture the drama of the sky (a major storm system was hitting the UK when I got this shot! ), hence the necessity for a tripod. Being on the west side of the island, Neist Point would be a fantastic location for sunset (assuming the sun is out when you visit!). Personally, I think a wide angle lens, between 16 and 40mm, is going to give you the best options here, but you might want to try some longer focal lengths for tighter shots of the lighthouse as well. 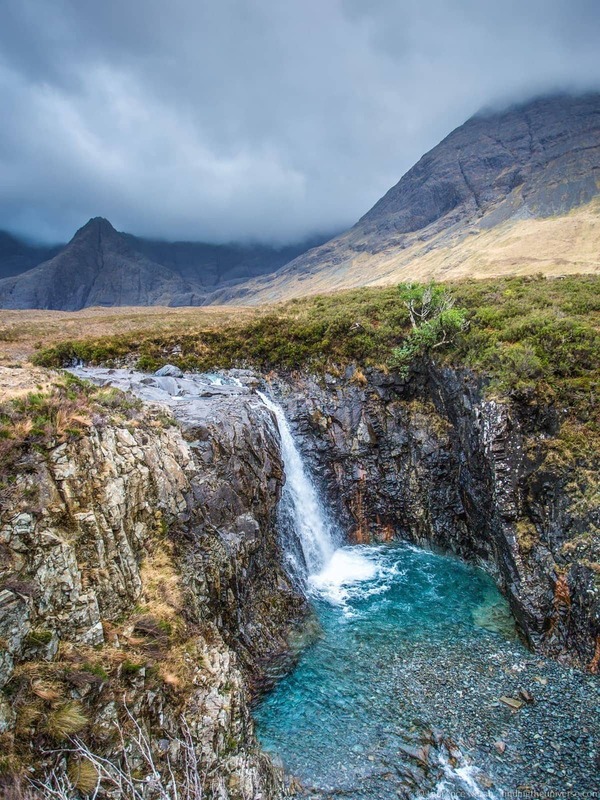 The Fairy Pools are a beautiful series of waterfalls and pools on the Isle of Skye, where the water is a spectacular blue colour. There are countless opportunities here for photography as you walk along the river, with a stretch of at least half a mile to play with. In terms of a specific photography location, I would say there isn’t really one. As you walk down and along the pools, you will find different spots that catch your eye, from small cascades to larger falls, like that captured above. There are also rocks to hop across, pools to shoot, and the mountain range in the background offers a nice backdrop. Because there’s flowing water here, I’m going to suggest you bring a set of neutral density filters and a tripod so you can achieve that lovely soft water affect. If that you’re not sure what I’m talking about, fear not, I have a whole post explaining neutral density filters and why you need them, to answer your questions. 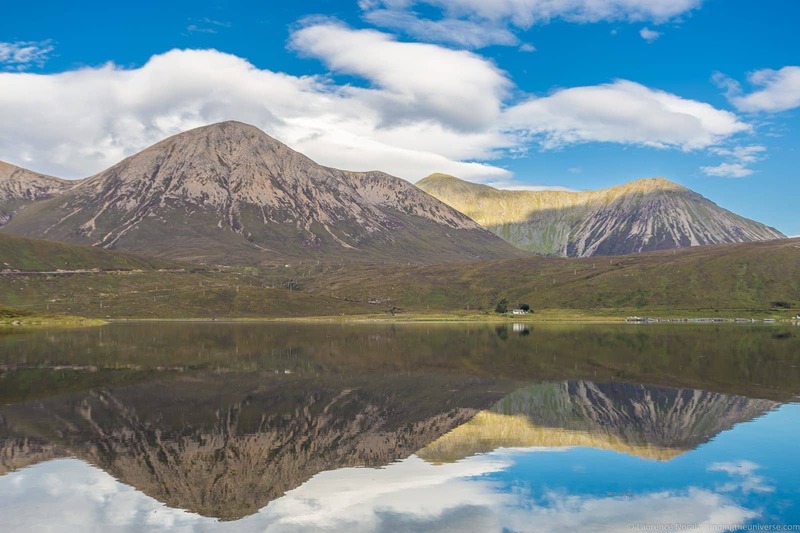 The Isle of Skye, like much of Scotland, has no shortage of Lochs to choose from when it comes to photography. All you have to do is hope for a still day so you can capture a beautiful reflection at the same time! One Loch that I particularly enjoyed photographing was Loch Ainort, which is a sea Loch on the east coast of the island. It’s about 17 miles north of the road bridge to Skye, and the town of Luib sits on its shore. For photography purposes, my suggestion is to drive along the south side of the Loch on the A87. Slightly west of the town of Luib there are a number of safe parking spaces which are well marked on the Loch side of the road (don’t stop on the road itself), from where you can get walk a few metres down to the Loch shore to get some photos. For the shot above, which has a house and the mountains in frame, it was taken at these GPS co-ordinates: 57°16’7″ N 6°4’2″ W. I used a wide angle lens to get as much in as possible, but different framing options at different focal lengths are possible. A little further north from Luib is the small settlement of Sligachan, home to a hotel which dates from 1830. This has long been a popular base for climbers and hill walkers looking to explore the Cuillin mountains, and there is an excellent view of the mountain range from here. 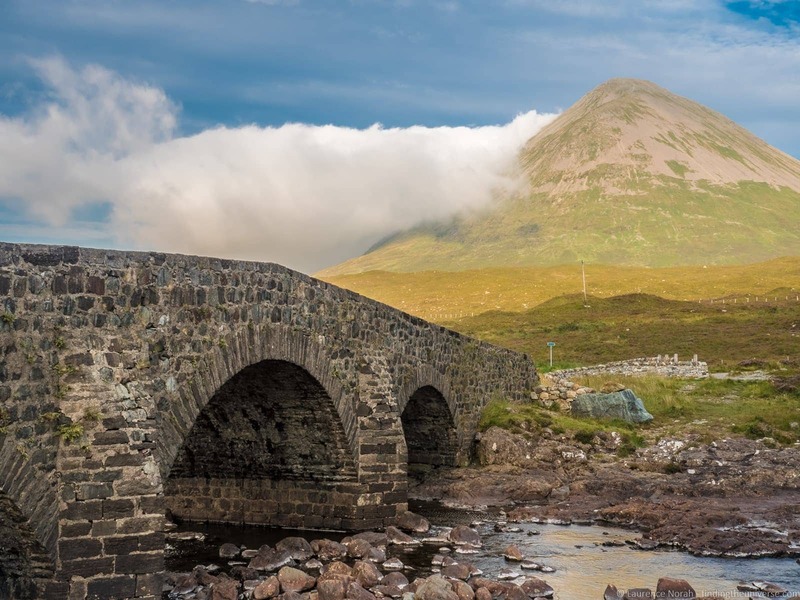 There’s also a lovely arched stone bridge here, Sligachan bridge, which offers a lovely foreground option. With the water flowing in the river, you have all the elements of a great shot. Depending on the time of year you visit, you will find different elements to work with. In summer for example, there might be wild heather you can incorporate in the foreground, as well as brightening up the hillsides. At times of rain, the river will be higher, giving you faster moving water to play with. There are lots of options, and two bridges here to play with. My suggestion is to incorporate these and the background mountain range into your shot, but pretty much any way you point your camera here you should come up with something great! In terms of parking, there is a car-park at the Sligachan Hotel, which many people use despite the sign saying it is for hotel guests only. Instead of doing that, there is a car park just before you get to the hotel on the left hand side of the A87 as you go north (here on Google maps). The town of Portree, on the north eastern side of Skye, is the jumping off point for the Trotternish Peninsula, and an excellent base. We’ve stayed here a few times, and there are a lot of dining and accommodation options here. 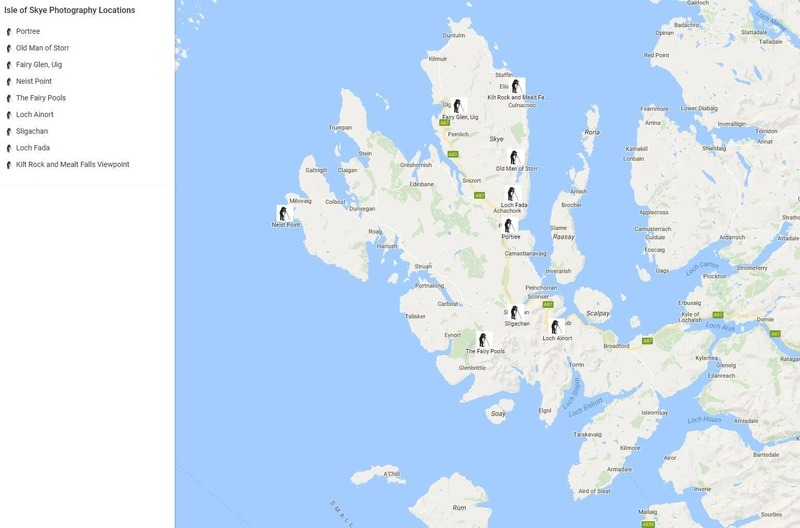 For more ideas, take a look at Jess’s detailed Highland and Skye itinerary, which has a whole section on Portree. But accommodation and dining are not why you are reading this post! 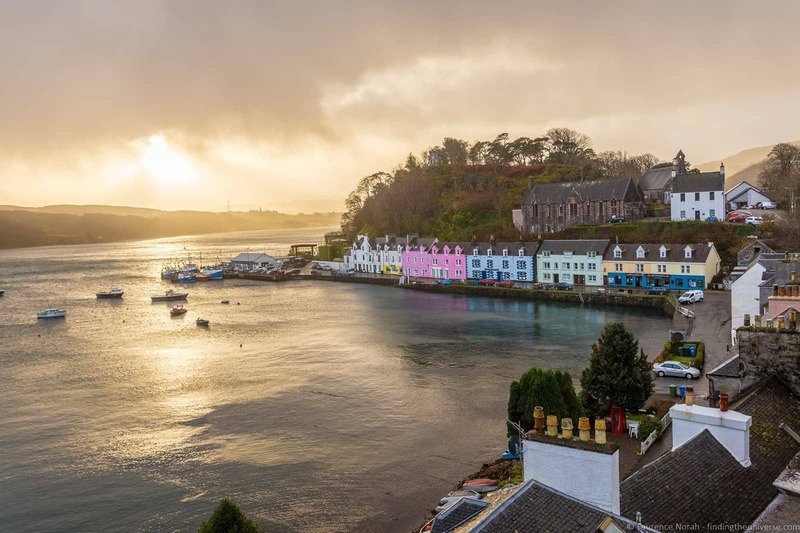 Portree is also a good photography spot, in particular, the colourful harbour area with it’s line of painted houses, makes for a lovely shot. The best place to shoot this from is above, from the road known as Bosville Terrace. From here, you can see down into the harbour and across the bay of Loch Portree. Ideally you’ll want calm conditions and the tide to be in, so as to maximise the reflection opportunities. This is good at sunrise, being on the eastern side of the island, as the light will be in your favour. A wide angle lens is best to get everything in for this shot. Another excellent Loch to photograph on the Isle of Skye is Loch Fada, which offers lovely views of a Skye classic – the Old Man of Storr (the next entry in our list). 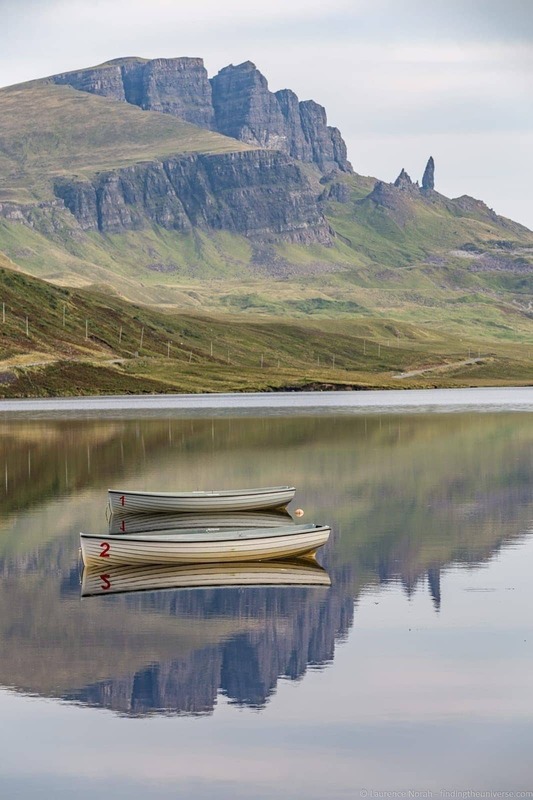 This is found on the Trotternish Peninsula about a fifteen minute drive north of Portree, and from the south end of the Loch, there are beautiful views of the Old Man of Storr, as well as the Loch itself. There are also sometimes boats moored in the Loch, which make for a lovely foreground. Again, you’re going to want to be still weather for the best reflections, and I’d suggest bringing a longer lens like a 70-200mm range, in order to get the Old Man of Storr properly into the frame. The shot above was taken at 130mm on a full frame Canon 6D from the very south point of Loch Fada, to give you an idea. 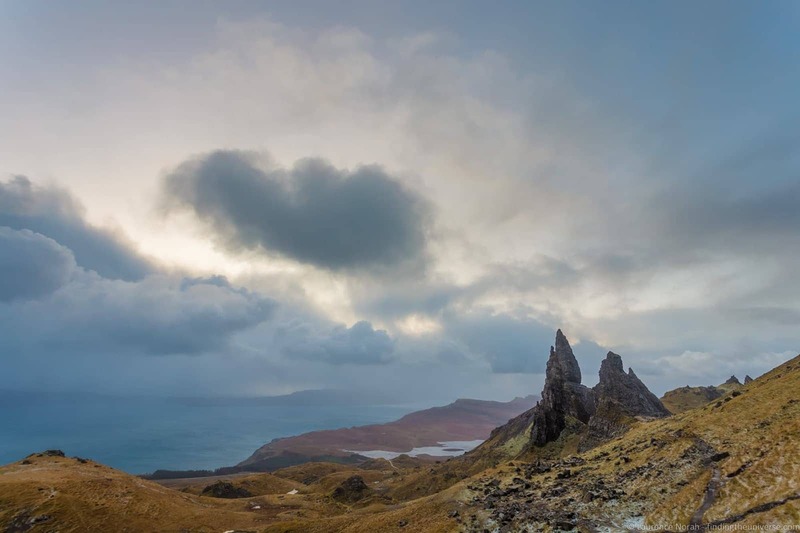 An absolute classic photography location on the Isle of Skye, the Old Man of Storr is a rock formation that looks like a finger sticking up into the sky. This does require a bit of effort to reach, in the form of a thirty minute or so uphill hike from the car park, which is easy to find about fifteen minutes drive north of Portree on the A855. Note that this is a single track road in parts, so if you’re driving yourself and are unfamiliar with this kind of road, you should check out my post on driving on single track roads for some pointers. The hike up (stay right as you go up the very well trodden path) will bring you to the Old Man of Storr, but for the best shot, instead of following the path to the rock formation itself, you want to keep walking to the right, under the base of the Old Man and a little further up the hill. The path is easy to spot and follow, and the views back as you get higher up the hill are truly epic (depending on the weather of course!). Depending on the weather you get, and how far you want to walk, you will want different lenses. A wide angle will give you nice shots of the Old Man of Storr and surrounding landscapes. If you have a clear day and the Cuillin mountains are visible, you should walk further and use a longer lens to compress everything together. Time-wise, you’ll want to come up here for sunrise, which was what I did for the shots above (although, as you can see, I wasn’t exactly lucky with the weather). If you get a good sunrise, it will happen just to the left of the Old Man of Storr, and you’ll be able to frame a lovely sunrise shot. Plus, sunrise is a lot less busy than the rest of the day (this is the most popular hike on the Isle of Skye), so you’ll be able to get some nice shots without swarms of people in your frame. 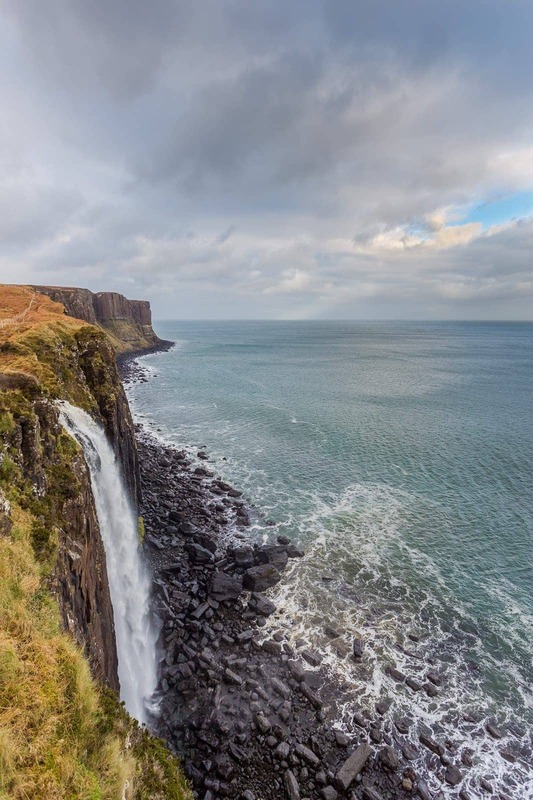 8 miles north along the A855 from the Old Man of Storr carpark (or a couple of miles south of Staffin), is the Kilt Rock and Mealt Falls viewpoint. Mealt Falls are a wonderful waterfall that crash off the cliffs here, and tumble a spectacular 55 metres to the sea below. The backdrop is the Kilt Rock, a basalt columnar formation that look a bit like a Scottish kilt. Hence the name. This is a really easy location to find and get to, as there’s a signposted car park and it’s just a few metres walk from the car park to the viewpoint. You don’t have many composition options to be honest as the viewpoint is what it is and there is no access to the coastline. I’d suggest a wide-angle lens is going to be your best option in order to get the falls in, and if you want a soft water effect, you’ll need a tripod and ND filters. There is a railing here though, which can make setting a tripod up a bit tricky. 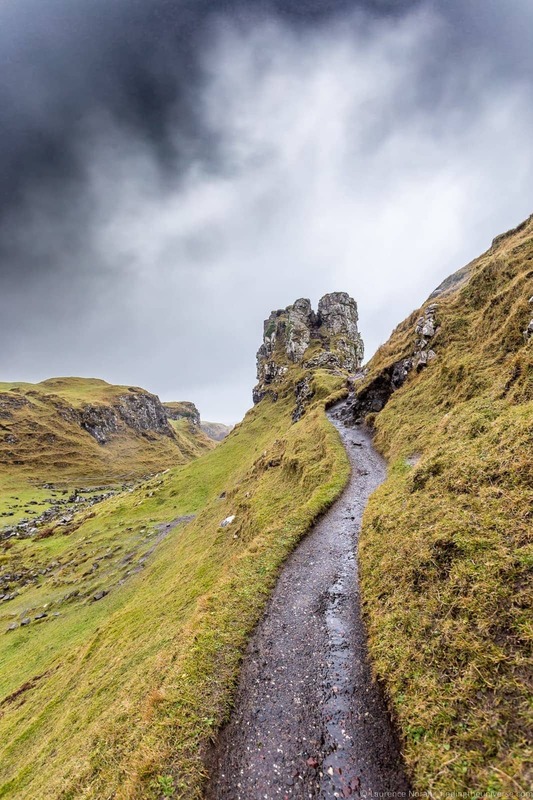 Formed by a massive landslip (it’s actually still moving), the Quiraing is one of the most dramatic landscapes in Skye. You’ll find it just near the town of Staffin, about a 30 minute drive north of Portree. Parking is available at the top of the ridge in a series of pull-offs that are fairly obvious, but don’t have an actual sign indicating they are for parking. Usually there will be a number of other cars here though, this is a popular spot, and also the start of the Quiraing loop walk, which is a two hour, 7km loop walk. 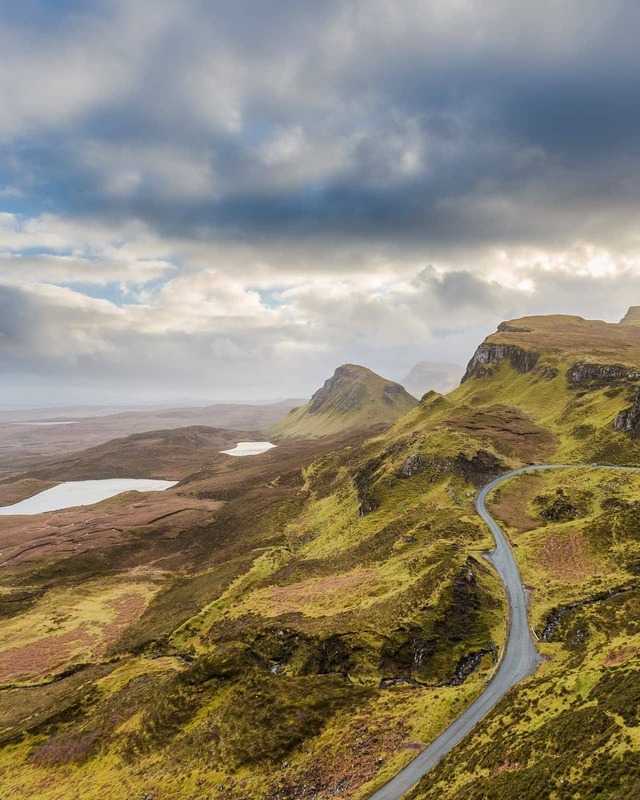 The Quiraing is a fantastic spot for photography, which excellent views stretching off in both directions. You’ll need to walk a couple of hundred meters from the parking area, but then you’ll be able to point your camera north or south along the ridge for some lovely photography opportunities. The shot above and the shot below were taken almost from the same spot, a little south of the car park above the road that winds up the mountain. The shot above was taken looking south, whilst the shot below was taken looking north. In terms of equipment, there are multiple composition options here that suit a wide range of focal lengths. A wide angle will get you a nice landscape shot like my first image of the Quirang above, whilst a longer focal length will let you compress the landscape into your foreground. The shot of Jess walking above for example was taken at 85mm. There’s also the opportunity to play with time, as the clouds scud across the landscape, so a set of ND filters and a tripod will open up even more possibilities. 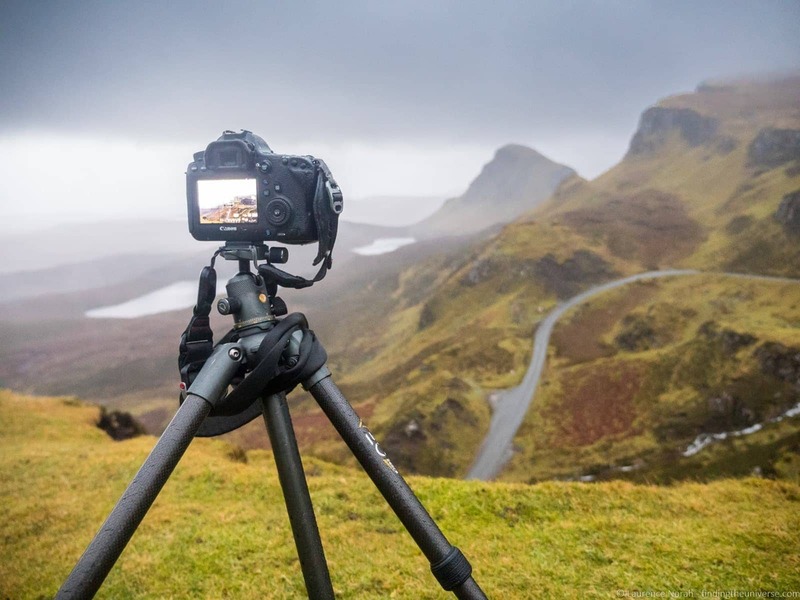 The Quiraing is a definite must-visit on your Skye photography adventure, there are a lot of options here and you’ll come away with a lot of great shots. 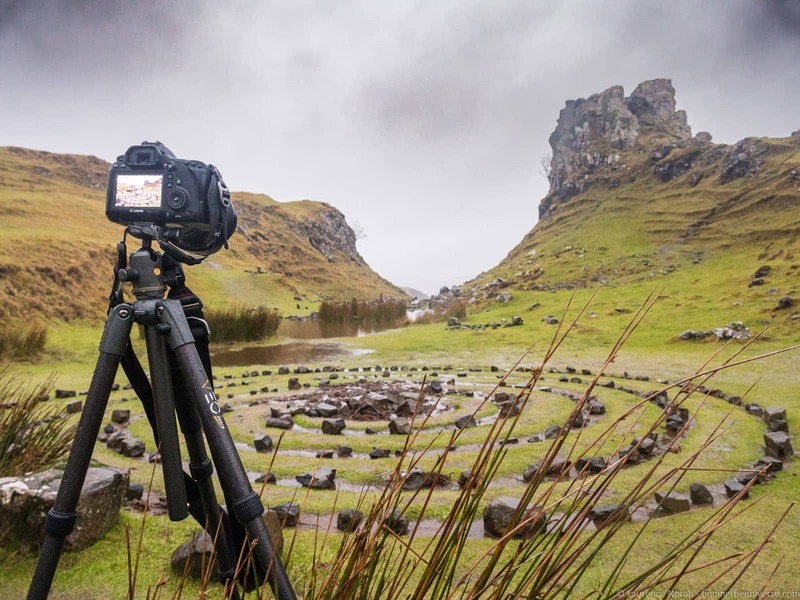 Last on my list of Skye photography locations is the otherworldly landscape known as the Fairy Glen. The reason for the name, as far as I can tell, is that the landscape is so unusual that fairies must live here! A series of rolling hills and hillocks which are lovely to photograph, the centrepiece is “Castle Ewen”. This is the highest point in the Fairy Glen, and it’s a rock formation that looks a bit like a ruined castle. If you squint. As well as the Castle, you’ll also find spiral rock formations and trails to shoot, and with a bit of creativity, you should be able to capture some lovely images. The Fairy Glen can be found just inland from the town of Uig on the east side of the Trotternish Peninsula. It’s not signposted, but the GPS location is here. There is a small amount of parking available on site, after which it’s a five minute hike up to the castle, which is quite obvious. I’d recommend a wide-angle lens here, to get everything in. Here’s a map of all the locations listed above for reference. You can see this on Google here. 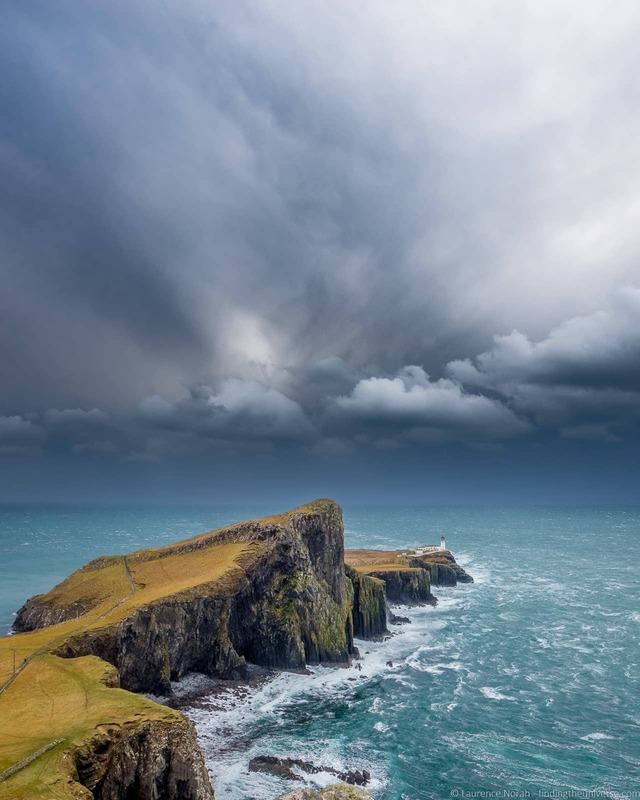 The Isle of Skye is a year round destination, although if you are interested in sight-seeing beyond just photography, you should be aware that many attractions are closed in the winter months. In addition, there is less accommodation available in winter as many B&B’s close. See our guide to visiting Scotland in winter for more information. That said, there are far fewer people here in the shoulder seasons and winter. Summer is a very busy time to visit, and parking becomes quite challenging. In addition, there will be a lot of people at the various sights around the island, who will invariably end up in your frame. Summer also brings with it two of Scotland’s less talked about features – the highland midge, and ticks. Midges are small flying biting insects that usually come out at dusk and dawn. They can be ferocious! Ticks are small blood sucking insects that embed themselves into your skin, and they can spread disease, so you’ll want to check your body at the end of each day if you’ve been walking off paved trails. If you visit in summer, then for both ticks and midges, we recommend packing some form of insect repellant like this. For the best combination of weather and less people, we’d suggest around May would be a good time to visit. For the least people, winter is a good option. We’ve visited Skye in the winter a couple of times, and whilst the weather can be a challenge, the light can be truly magnificent if you are lucky. Plus, sunrise is fairly late, so you don’t have to get up too early to take advantage of it! Just be aware that you will have far fewer daylight hours to play with, and it can be cold, windy, and snowy in winter. So be prepared! We’ve visited the Isle of Skye a number of times. For a photography focused trip like this, the best option is definitely going to be to drive yourself, as this will give you the flexibility to move around the island at your own pace and visit the destinations you are most interested in. If you would prefer not to drive a car, there are multiple tour operators who will take you to Skye. We visited Skye with Rabbie’s, on their five day Highland Explorer tour, an experience you can read about here. Rabbies offer a number of tours that go to Skye, so this is definitely an option to consider. We like Rabbies tours as they have a positive responsible travel ethos as well as small group sizes, comfortable vehicles, and knowledgeable guides. Obviously, if you do a group tour you’ll be at the mercy of the itinerary. 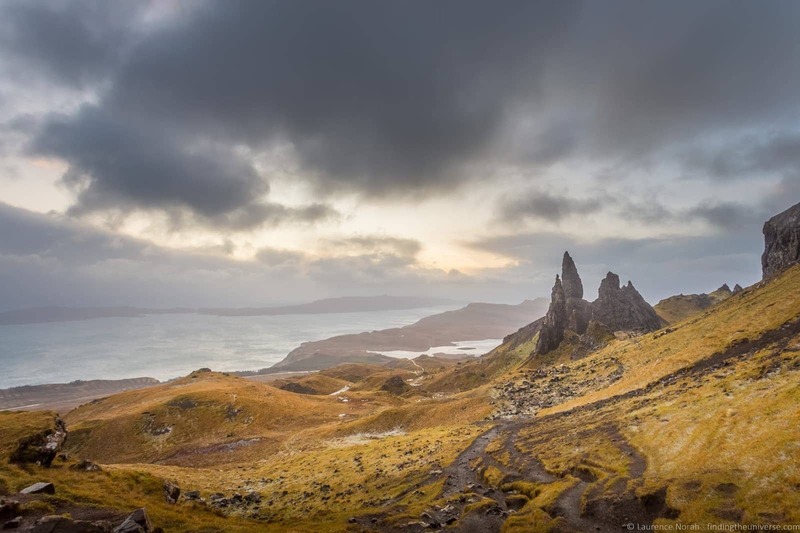 That said, tours will call at the majority of stops on this list as they are popular, you just might not make it out to some of the further flung destinations like Neist Point, or have time to do hikes like the Old Man of Storr. Finally, there are local buses that cover the majority of the island, although you will be at the whim of the bus timetables, and depending on the time of year and week, these can be somewhat irregular. You can see timetables here, although we’d suggest finding the number of a local taxi service as a backup plan as well. From a photography perspective, I’d suggest you bring a pair of lenses – something that will go wide-angle, and something that will let you zoom in. A range of 17mm – 200mm should do, unless you have specific wildlife photography in mind for which you might need a longer zoom. 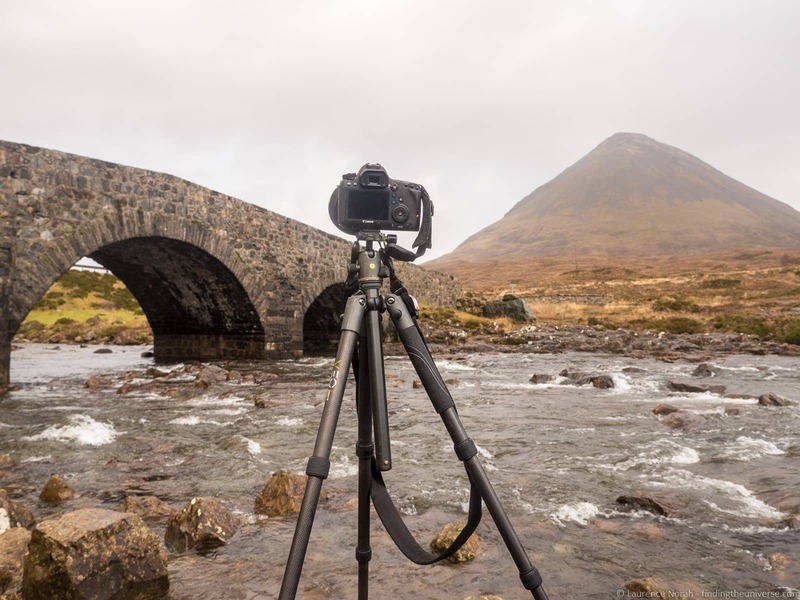 I would also suggest a travel tripod and a set of neutral density filters so you can do some long exposure work on the landscapes and waterfalls. I’d recommend either a 10 stop or a 6 stop ND filter. You will also need a good bag to carry your gear – personally I love my Vanguard Alta Sky 49, which keeps all my gear safe and dry (it has a built in raincover), plus it has an innovative tripod carrying system. Speaking of tripods and Vanguard, I promised you a discount code. If you’re in the US, you can save 20% off anything in the Vanguard US store by using code FindingTheUniverse. If you’re interested in what camera gear we travel with, we have a whole post on our photography gear. If you’re in the market for a new camera for your Skye photography expedition, I have a post on picking the best travel camera to help you out. 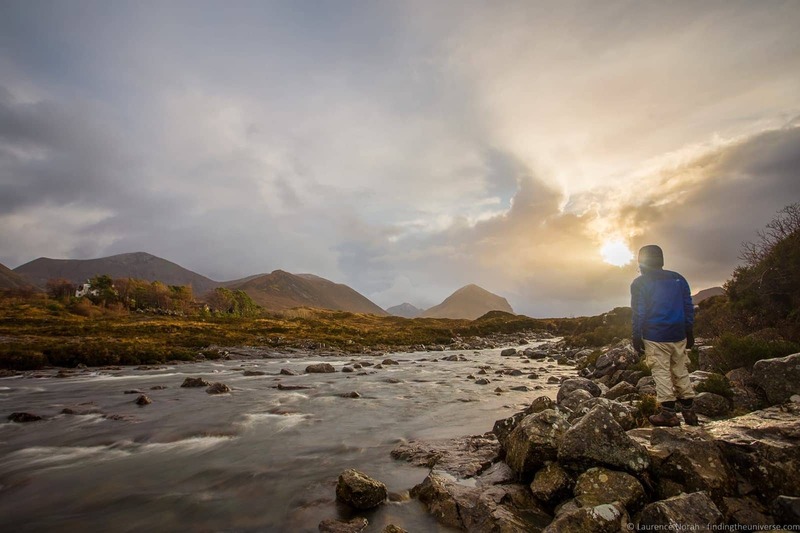 You’re also going to need more than just photography gear for Skye. I would suggest decent hiking boots, clothing layers and, if you’re visiting in winter, thermal base layers, gloves and a hat. 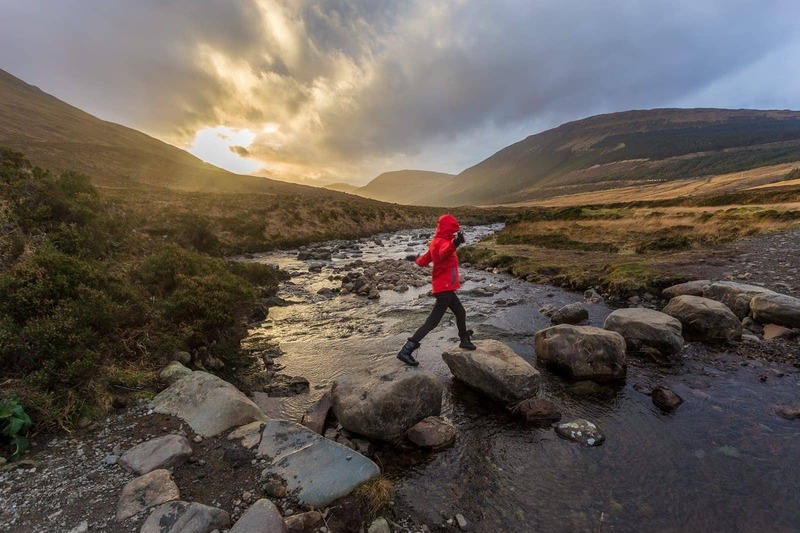 The wind can be bitingly cold, and rain can come at any time of year, so wind and rain proof gear is definitely a good idea! And that sums up my guide to the best photography locations on Skye! Before you go though, I just wanted to let you know about some other resources that you might find useful to help you plan your trip to Skye and Scotland. And that’s it! 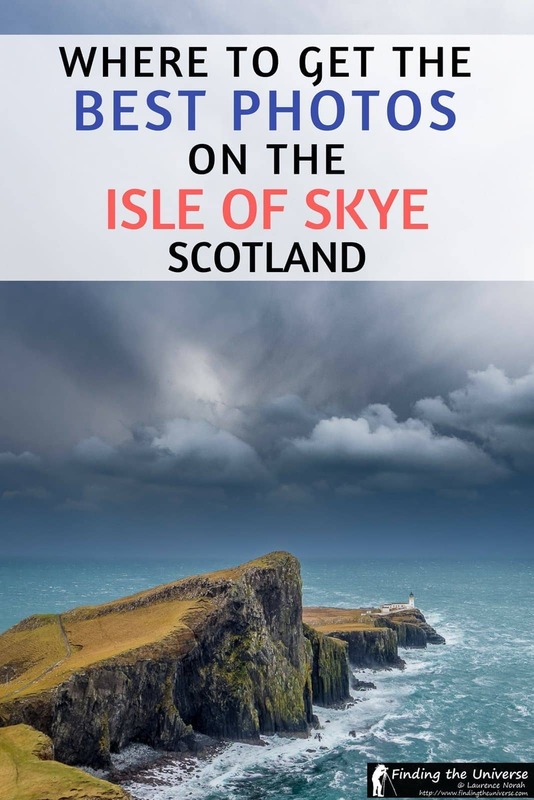 I hope you found my Isle of Skye photography guide to be useful. If you’ve got any questions, or have a favourite spots I left off the list – do let me know in the comments below! My husband and I are setting off on the 650+ mile drive to the Isle of Skye this weekend (Easter, end April 2019) and I have just stumbled across your blog. Thank you for sharing your amazing images, tips and tricks. I found this blog extremely informative and have made copious notes for our trip. Have a wonderful trip – I hope the weather is nice for you guys 😀 Do drop back and let us know how you enjoyed it! Hi There, lovely summary you wrote! Thanks very much 😀 So Google shows two lochs next to each other at this location, one of which is Loch Leathan, and then the southern one which is called Loch Fada. Our guide on our first visit to Skye also called it Loch Fada. So maybe it’s labelled wrong, or there are two lochs with the same name? oh wow even three loch Fadas’ on Skye, did not see that coming. Two more or less above each other and another one near Talisker. Do you book photography trips here? Would love to hire you for some shots of my girlfriend and I when we visit in May 2019. Your photos are amazing! Please email me if this is an option. Thank you SO MUCH for thus article!! I am booking an Airbnb today off the back off this!!! It may be a 9 hour drive but after this article it is a MUST! Great article! Thank you for sharing these great photos! I’m going to Scottish Highlands and Isle of Skye myself this December. 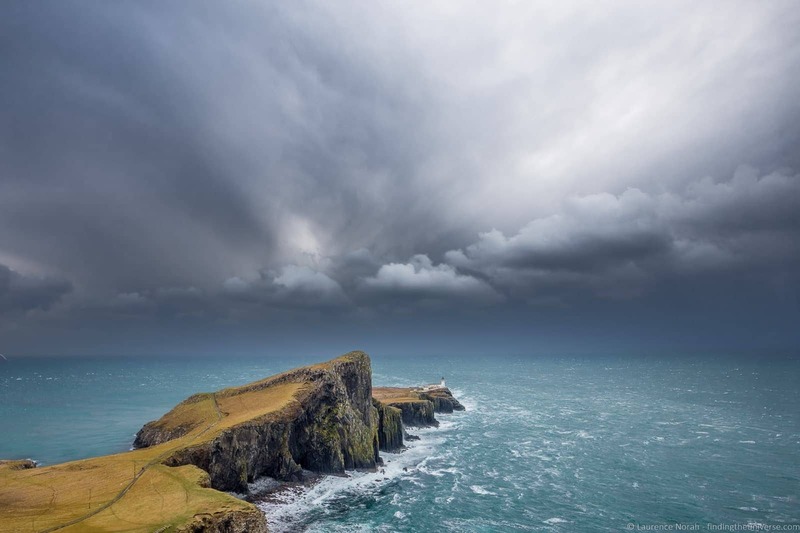 I’m new to photography, and I have a question about the Neist Point photo. You mentioned that you blended 5 different exposures to bring out the sky. Do you have an article on how to do this? It looks really cool! Have a great trip to Skye, it’s a stunning place. Just make sure to wrap up warm, Scotland can be a bit windy and cold in December! Safe travels, and thanks for stopping by to leave us a comment, we really appreciate it! Cool article. Super informative. I lived in Scotland for two summer buts never made it over to Skye. I’m in and out of the UK a lot so maybe this summer I’ll have a trip there. Or May as you suggest to beat the crowds (and the midges). Thanks for your insight. Thanks Marta! Skye is definitely one of our favourite places in Scotland, but the crowds and the weather can be a challenge 😉 Hope you make it there soon!